The 2017 iMac is a fine update to Apple’s desktop computing platform, but suffers from a few nagging design quirks, as well as its own place amid rapidly-evolving desktop design trends. Still, for Mac fans in need of an upgrade, the 21.5-inch model presents surprisingly impressive value. When Apple released the original iMac nearly 20 years ago in August 1998, Steve Jobs envisioned it as the Apple computer for the everyperson – with a playful design, free from any floppy disks or CD trays. And, finally, the iMac 2017 is closer than ever to the Steve Jobs’ original vision. We would certainly not call the iMac 2017 a ‘cheap device’, but that doesn’t stop it from being one of the best Macs from a sheer value perspective – and it’ll stay that way, since the iMac 2019 starts at a higher price. You won’t find any CD drives, but you’ll still have to deal with a mechanical hard drive. However, recently Apple seems to be ditching hard drives in favor of SSDs, so that makes us hopeful for the future. Of course, you can’t really talk about the iMac without talking about peripherals. The Magic Keyboard and Magic Mouse 2 seamlessly sync with the iMac. It really is a perfect all-in-one PC, which in and of itself makes it one of the most compelling computers on the market right now. So, while the new iMac doesn’t radically change the formula, we’re not complaining. The pure simplicity of the iMac’s design language goes far, especially when paired with the 7th-generation Intel Kaby Lake desktop processors. The iMac’s price starts at a mere $1,099 (£1,049, AU$1,599), which will include both the Magic Mouse 2 and Magic Keyboard in the box. That’s $178 (£178, AU$248) for just the accessories alone. Of course, you’re getting a 21.5-inch iMac with a Full HD (1,920 x 1,080) display and Intel Iris Plus 640 graphics, which is integrated into the 7th-generation, dual-core 2.3GHZ Intel Core i5 processor, but it’s a commendable value all the same. As you can see from the spec sheet, the iMac we were sent for review is a step up from the entry-level model in every regard, save for the hard drive, and for just another 200 bucks at $1,299 (£1,249, AU$1,899). From there, you can configure the iMac however you want, making it as affordable or powerful as your heart desires. Do you need to live out your creative aspirations through discrete graphics? Done, with AMD RAdeon Pro 560 graphics. Do you need more RAM to run professional applications and more than 3 Chrome tabs? Have at it, and configure the iMac with up to 32GB of RAM. You can even bump the display up, and opt for an iMac 27-inch with virtually the same components as the iMac we reviewed here, but with Radeon Pro 570 graphics for $1,799 (£1,749, AU$2,699). If that’s not enough, we’d have to recommend that you take a look at the iMac Pro, coming in at $4,999 (£4,899, AU$7,299), it’s an extravagant purchase for most people, but the prospect of up to 18 cores of raw power should be very enticing to the professional or power users out there. The iMac’s price falls in line with other high-end all-in-one PCs out there, namely the iMac’s chief competitor in the original Surface Studio at $2,999 (£2,999, AU$4,699) – though it’s been replaced by the more expensive Surface Studio 2. You’ll be able to find cheaper all-in-one desktops out there, but they won’t be this well-built or include components as powerful as the iMac’s. If you’re looking for an even more budget-friendly option, and you already have a monitor, keyboard and mouse lying around, you could also go with the Mac Mini at $799 (£799, AU$1,249) for comparable power to the entry-level iMac. But, it doesn’t include any of the accessories that the iMac boasts. You’ll be able to find all of the 2017 iMacs through Apple’s website itself, or other retailers like Amazon. The iMac doesn’t look or feel radically different than past iMac models. That’s not necessarily a bad thing, as this brushed aluminum all-in-one is something to see. However, after a few persisting design choices – not to mention its overall design in the face of new rivals – give us a bit of pause. That iMac silhouette is still iconic, though – there’s a reason that it’s become a staple of offices, home and otherwise, in TV and films for years. The iMac’s simple yet elegant appearance manages to be both striking and avoids getting in the way while working. Then, of course, there’s the seemingly impossible thinness of the iMac, considering exactly how much is packed into the display portion of the computer (i.e. literally everything). However, the iMac is competing with Microsoft’s Surface Studio lineup, so we can’t ignore just how much thinner and more impressive the iMac could be if Apple just leveraged what it’s learned from developing Mac Mini computers toward crafting an iMac base that holds all the computer's guts and ports. Looking at the Surface Studio in the TechRadar office and then back at the latest iMac, it’s frankly baffling that Apple didn't beat Microsoft to that punch years ago. Despite this, Apple managed to cram all the ports you could ever want or need from an all-in-one computer into the back of this iMac, so kudos. Further to the point, Apple’s pursuit of absolute thinness despite cramming all of the iMac’s innards behind the display has only led to suffering audio. A total of two stereo speakers rest within both sides of the iMac’s bottom-most edge and, while they deliver impressive volume, as a result the narrow chambers deliver highs and mids no better than your average Ultrabook can. That’s not cool for a device that takes up as much space as an all-in-one does – no matter how impossibly thin it is. But, we need to talk about the Magic Mouse 2 – it needs a revamp. It clicks and tracks amazingly, as you’d expect from the company that inspired everyone else to up their input game years ago. However, the fact that you can’t charge the mouse while using it, because of where the Lightning charging port is located, makes no sense. Fortunately, the iMac’s included Magic Keyboard 2 is simply delightful to type on, and the days long battery life of both input devices are a major plus – considering that you have no other choice but to buy older wired models, if you’re not into wireless peripherals. 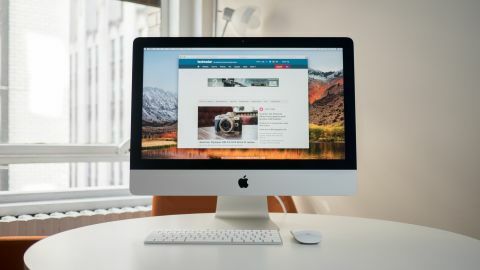 Because macOS Mojave isn‘t compatible with the majority of normal benchmarks that we run at TechRadar, it’s hard to compare the Apple iMac against the Windows 10-based all-in-one PCs we’ve reviewed in a comprehensive way. That said, it’s clear in the tests that this iMac benefits quite a bit from its 7th-generation (Kaby Lake) Intel Core i5 processor over the Surface Studio’s quickly-aging, 6th-generation chip. For example, the Apple iMac shows stronger single-core performance over the Surface Studio as well as moderately higher multi-core performance in Geekbench. Still, the Surface Studio does have a stronger GPU with more memory, which shows in the numbers – the Microsoft all-in-one scores 20fps faster in Cinebench than the iMac, despite the older chip. Our biggest takeaway from using the latest iMac is its simply stunning display. Seriously, if you can swing it, spring for the mid-range 21.5-inch model, because that 4x jump in pixel density – and the better graphics tech behind it – is well worth it. Photos look impressive on the iMac’s panel and are expertly colored, thanks to its P3 color gamut. That’s an important point, because that improved color reproduction affects all ends of the system, regardless of the resolution of the content you’re viewing. Even videos at 1080p look drastically improved thanks to P3. Sadly, this has made going back to our usual 1080p screens with RGB color a sobering experience. The iMac 2017 is a fine update to Apple’s all-in-one computing platform. For the money, at least for the 21.5-inch model, you’re getting a beautiful machine that’s more than capable of handling every task you throw at it – from web browsing to photo editing. That said, nothing exists (for long) in a vacuum. We can’t ignore that the iMac seems to have fallen behind the trends of modern all-in-one computers, namely those spearheaded by Microsoft’s Surface Studio. Plus, we’re not fans of the audio performance and, while the Magic Mouse 2 is a wonderful mouse to use, the fact that it can’t be used while charging is an oversight. At any rate, those seeking a 4K-ready – or even 1080p – all-in-one that’s as powerful as it is aesthetic will find what they’re looking for in the iMac 2017. Despite a few minor issues and an arguably dated design, the average Mac fan (or would-be fan) will find plenty to love about yet another iconic Apple computer.